We will speak with you about your case. You complete online intake questionnaire form. We collect physical evidence & documents. Texas, New York, New Jersey, & Washington, D.C. 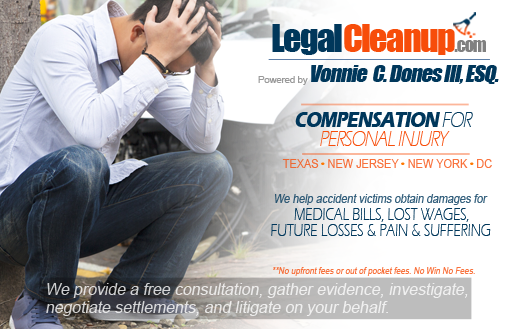 Personal Injury Lawyer Helping Accident Victims Obtain The Compensation They Deserve. Have you been injured in a truck, motorcycle, bus, taxi, train, or car accident? Have you been assaulted on commercial property which failed to have adequate security? Have you been injured on the job? Are you a victim of a slip and fall or dog bite? If so, we can help you recover money for your injuries. You receive peace of mind knowing that you have an attorney handling your lawsuit every step of the way. We conduct settlement negotiations and litigate on your behalf. We cover the upfront fees needed to pursue your personal injury claim, such as court and filing fees, costs of obtaining your medical records, and costs for expert services in medicine, accident reconstruction, and other fields. If you have been injured by a person or business, we can help you investigate your claim, gather evidence, negotiate a settlement, obtain a qualified medical professional to diagnose and treat your injuries, file a lawsuit, and collect the money you are owed. Our law firm handles car accidents, dog bites, assaults and inadequate security claims, slip & fall accidents, work injury accidents, medical malpractice, and other accident claims. We prepare your case from start to finish. We will guide you through the entire process, including, but not limited to, depositions, interrogatories, mediation, and arbitration. We only get paid, if you get paid. In addition, we will ensure your medical benefits under personal injury protection (PIP) are being covered or ask doctors to wait until your case is resolved. We understand how complex a personal injury claim can be and we will work with you to make your life less burdensome. Any expected future losses, like the cost of future treatments, funeral expenses, or loss of earning potential. Our law firm will provide you with a free consultation and prompt legal help through phone calls, e-mails, and our state-of-the-art online client management system.